WILL TAKE MOST LAMP SHADES BULB NOT INCLUDED. LENGTH OF READING ARM 58 cvm. THERE IS A HALOGEN BULB IN READING ARM. NO SUITABLE PLACE. To view the full range just type 'Bellis' into the search box. Paper Lantern Shades. Light Bulbs. Traditional Ceiling Lights. Kid's Lighting. Tiffany Wall Lights. Tiffany Ceiling Fittings. Fabric Shades. Bright nickel & mink faux silk. 40W E14 candle (Required). A stainless steel, outdoor, PIR wall light for directing light upwards and downwards. Betta Lighting. THE LIGHTING & ELECTRICAL SPECIALISTS. Add this quirky table lamp to your desk or bedside table for a modern update. The 2 parts of the slim matt black body curve upwards from the rounded base before reaching the singular light. Paper Lantern Shades. Firstlight 5080 Franklin Floodlite RRP £94. Light Source : 1 x 50w GU10 240V. Finish : Satin Steel Silver. Floor or table surface uplight. Perfect for creating ambient light from behind sofa’s, washing walls or shadowing effect of plants/statues etc. Material Acrylic beads & steel. Light technology Eco Halogen. Otherwise your item will be despatched automatically. Product code 5052931322046. Model BB6555-GRY1. A stylish Mother & Child Floor Lamp in Satin Brass finish. We are LANCASHIRE LIGHTING: We're one of the best known and well respected lighting wholesalers in the UK. The small print. Now that's helpful ! Interior Lighting. Bathroom Lighting. Outdoor Lighting. LED Lighting. Lighting Accessories. The Knightsbridge SPGU3BC GU10 Ceiling Spotlight Bar is a contemporary shaped ceiling mounted spotlight unit with a round base. Ideal in any modern living Room, bedroom, dining Room and also excellent value. Paper Lantern Shades. Provide 2 bold highlighting beams to your living room or office with this striking floor lamp. Bathroom Lighting. Ceiling Pendants. Modern Ceiling Lights. Tiffany Ceiling Fittings. Overall 41.8cm H x 23cm W x 23cm D. Soft brass plate and taupe cotton mix. Constructed from steel and fabric. This may not be suitable as a gift. Shade Required Yes. Shade Included Yes. Base Colour Brass. 24cm H x 10cm W x 10cm D. Accommodates: 1x 40w E14 candle (not included). USB charging port. No Reserve. Southern Ireland (EIRE). Scottish Highlands, Scottish Isles, Northern Ireland, Isle of Man and Isle of Wright. SKU EG85981. 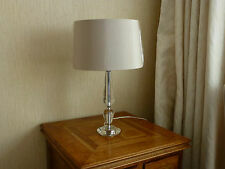 Product Info: Eglo - Troy 3 Glass Table Lamp EG85981. Material Steel. Quality Products. BATHROOM LIGHTING. 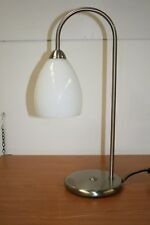 Product Info: Firstlight - Floodlite Uplight Table/Floor Lamp - 5080SS. SKU 5080SS. BATHROOM LIGHTING. CLEARANCE CORNER. Quality Products. This Modern Single Table Lamp from the 'Astoria' range by Endon Lighting looks great and is ideal wherever a modern look is desired. The Table Lamp is Double Insulated. The ASTORIA-TLCRY has a Clear Acrylic / Mink Faux Silk finish.